Please Note: This article series about Alexa™ assumes you have already set up your BroadLink hub with the phone app (see home theater phone app article series). 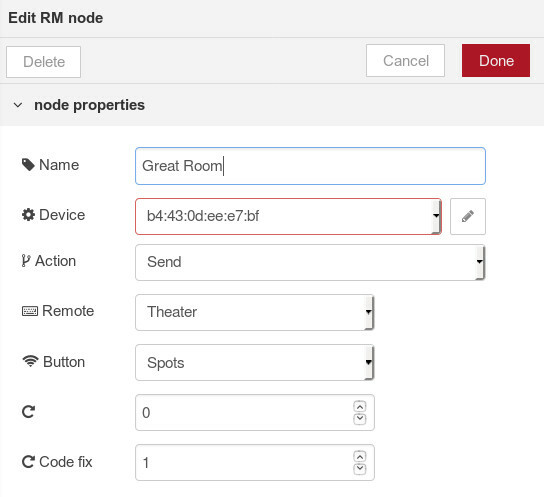 We are also assuming you have started Node-RED on the Pi, ready to create your first flow with your BroadLink™ hub. In the previous Part 2 of this series, we discussed how Alexa™ can be used with the Raspberry Pi® and the Node-RED visual design system to control blinds, shades, window openers and many other devices. 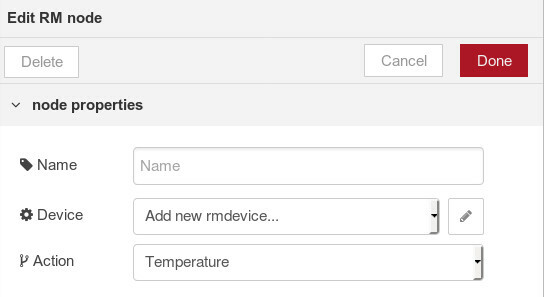 In this article (Part 3), we'll actually deploy a BroadLink RM Pro node and learn how to configure it to allow control of various devices that you had previously configured with the phone app. The PROPERTIES dialog is where you define which type of ACTION you wish to perform with the hub. You will be able to simulate all the button presses you set up in the phone app (see home theater phone app article series). We will be explaining how to transfer that information from your phone to the Pi and Node-RED shortly. The CONFIG NODE dialog is where you set WHICH HUB you wish to control. The faint default entries are put there to give you an idea of what type of data the system is expecting. You will have to know the MAC address and IP address of the BroadLink hub on your local WiFi router before you can proceed any further. We are also assuming you have assigned a static IP address to the hub, bypassing the DHCP system on the router, so that the IP address cannot change. If you don't do this, the IP address of the hub can change, rendering the control system useless. To repeat, the CONFIG NODE dialog is where you set WHICH HUB you wish to control. The MAC ADDRESS is always the same (it goes with the hub), and the IP ADDRESS assignment should also stay the same, if you have locked it down with a static IP address assignment. The CATALOG FILE LOCATION is where the button data from your phone app is replicated, and we'll cover that topic shortly. When you have completed these 3 entries, please press the ADD button to return to the PROPERTIES DIALOG. See the image below for what you should expect, when everything is working properly. You won't see this until the button data has been copied from your phone, which we will cover shortly. TIP: We found that we had to stop and restart Node-RED before it would pick up the hub CONFIG data, and it may even be a good idea to reboot the Pi if you are having trouble. NAME: This can be anything you like. DEVICE: This is the MAC address picked up from what you entered in the CONFIG sub-menu. PLEASE NOTE: After choosing your ACTION in the drop-down selector, the remainder of the settings will adjust according to the selection. We are only interested in the SEND action at the moment; the other ACTIONS will be covered at a later time. REMOTE: The selection in this drop-down list is picked up from the files that will be transferred from your phone. If you have different phone screens for different rooms or other functions, the names you gave them in the phone app will be shown here. BUTTON: The selection in this drop-down list is also picked up from the files that will be transferred from your phone. All the buttons you had on your phone screen for the REMOTE selection above will be shown here. For the purpose of simplicity, we have selected our spot lights in our home theater for this SEND example. As mentioned previously, none of the above dialog items will function properly until you have copied some files from your phone to the Pi. You may recall that, with the phone app, you can instantly clone your remote control screens to any other phone by using the SHARE function in the phone app MAIN MENU. This clever function is also used for transferring the files to the Pi. Create the Transfer Data: Go to the main menu in your BroadLink™ phone app and set up the SHARE. This will write the required files to a folder called SharedData in the file area of your phone. You won't actually be performing a SHARE; this procedure just makes sure the SharedData folder has been created. Your phone may not have exactly the same folder structure, but it will be similar, and the SharedData folder will have the same name. Transferring the Files: There are numerous ways to do this, but we found that the easiest method is by email. A long press on each file brings up the 'share' icon, with email attachment being one of the options, so we sent each file to ourselves at an email address. We saved each of the 3 files into that folder, and then we were able to make everything above work. Just keep in mind we had to stop and start Node-RED to make it pick up the data, and it may even be a good idea to reboot the Pi.